The word spondylolisthesis arises from the Greek word spondylo means spine, and listhesis means slipping down a slippery path. Spondylolisthesis is a condition of the spine in which there would be a forward or backward slippage of one vertebra on an adjacent vertebra (vertebrae are small bones forming the backbone). It usually occurs in your spine in the lumbar area (lower back region). Spondylolisthesis is categorized into 5 major types. (Isthmic Spondylolisthesis, Degenerative Spondylolisthesis, Congenital Spondylolisthesis, Traumatic Spondylolisthesis, and Pathologic Spondylolisthesis). Isthmic and degenerative types of Spondylolisthesis are more common than other types. Spondylolisthesis is a painful condition, but it is treatable in most of the cases. 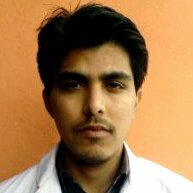 Both conservative (medication, physiotherapy) and surgical methods may be used. Proper exercise techniques can help you avoid this condition. Isthmic Spondylolisthesis is caused by a defect in a part of the vertebra called the pars interarticularis. This defect leads to the vertebra to slip forward. Degenerative Spondylolisthesis may be caused by arthritis occurs when the joints, lose their ability to keep the alignment of the spine in its normal position. It can cause the vertebra to slip forward. In children, spondylolisthesis usually occurs between the 5th bone in the lumbar vertebra and the 1st bone in the sacrum (pelvis) region. It is often due to injury (acute trauma) or a congenital disability in that area of the spine. In adults, it occurs commonly due to degenerative arthritis (abnormal wear on the cartilage and bones) of the spine. Spondylolisthesis also caused by bone disease and fractures. Certain sports activities, such as weightlifting, gymnastics, and football, put excess stress on the bones in the lower back. They also require that the athlete constantly overstretches the spinal column. It can lead to a stress fracture on of the spinal vertebra. Stress fractures can cause a spinal bone to become weak and shift out of place. These symptoms are usually aggravated by some of the activities such as standing, walking, while rest will provide temporary relief. Treatment options for spondylolisthesis depend on several factors, including the age and overall health of the patient, severity of the symptoms, and the extent of vertebral slippage. Treatment most often is conservative, involving rest, medication, and physiotherapy. More severe spondylolisthesis may require Decompressive laminectomy or spinal fusion surgery. Medical management: the person should take a break from sports and other activities until the pain subsides. An over-the-counter NSAID (non-steroidal anti-inflammatory drugs) are recommended to help reduce pain and inflammation. 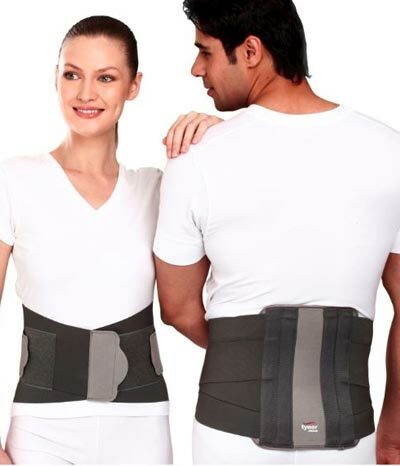 A lumbar brace or back support might be used to help stabilize the lower back and reduce pain. A program of exercise and physiotherapy will help increase pain-free movement, and improve flexibility and muscle strength. 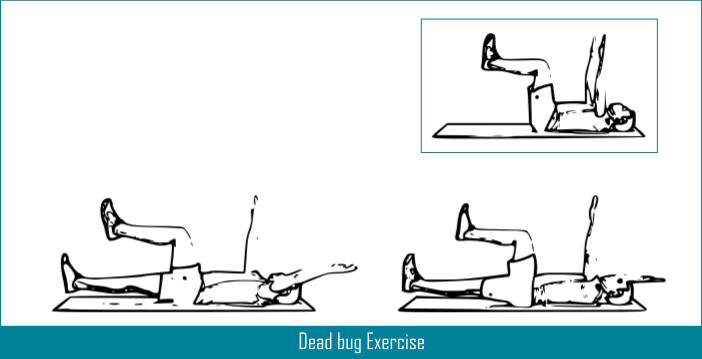 Physiotherapy: Stabilization exercises are the mainstay of treatment. 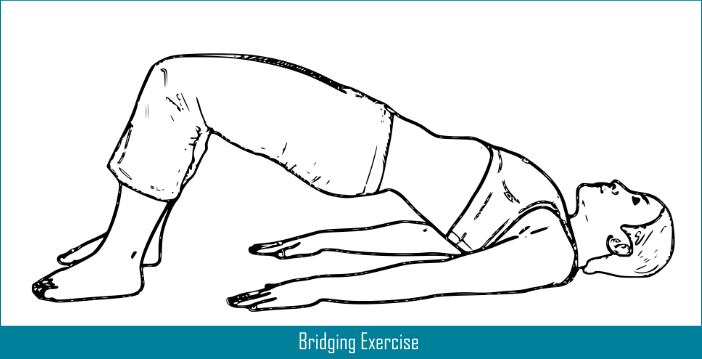 These exercises strengthen the abdominal and back muscles, minimizing movement of the spine. 8 to 12 weeks of aggressive daily treatment with stabilization exercises are needed to achieve clinical improvement. After a thorough evaluation, your physiotherapist will be able to provide you with a personalized spondylolisthesis exercises program to help decrease pain that is caused by the spinal condition called spondylolisthesis. 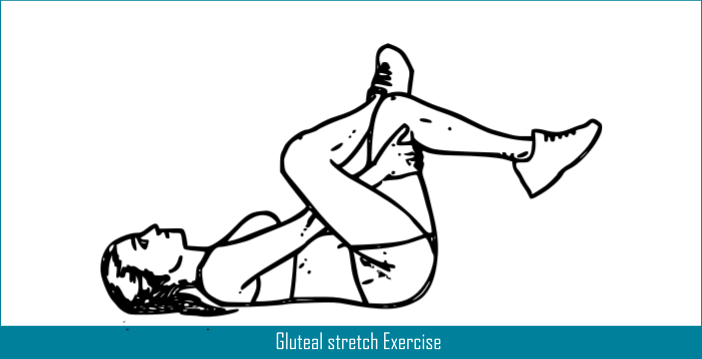 This program often includes lumbar flexion exercises, core stabilization exercises, and exercises or stretches for the muscles of the back, hamstrings, and hips. Low-impact exercise such as cycling or swimming is also recommended to promote healing and decrease pain. Usually, the doctors prescribe the spine strengthening exercises to strengthen the abdomen and back muscles, and also to increase the joint flexibility, which helps prevent and rehabilitate the severe type of lower back pain. Maintaining the daily activities with tolerable limit can also help achieve a faster recovery in spondylolisthesis, instead of taking bed rest. 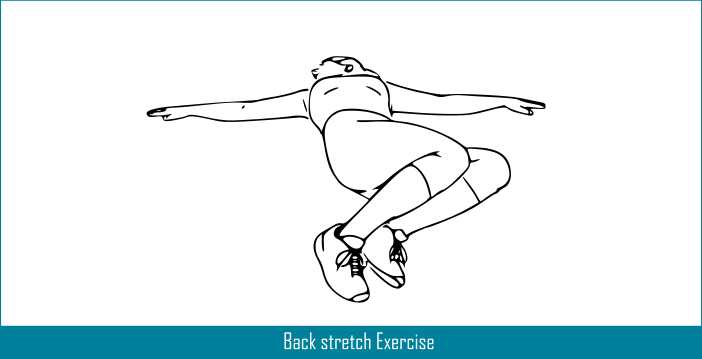 Your doctor or physiotherapist may suggest you do some of the below-mentioned spine strengthening exercises to relieve the back pain caused by the spondylolisthesis. Note: It is advised to take proper medical advice before practicing any exercises mentioned below. Lie on your back with your knees bent and feet flat on the floor. 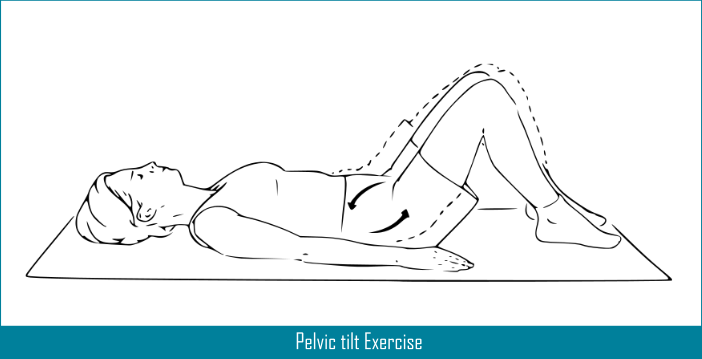 Pull your belly button in towards your spine and push your lower back into the floor, flattening your back. Hold for 15 seconds, and then relax. Repeat five to ten times. Lie on your back with your knees bent. 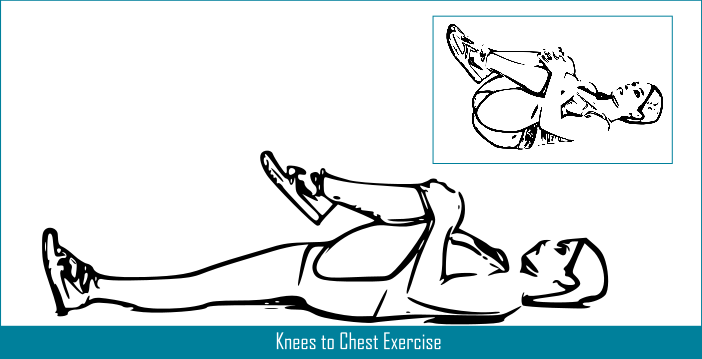 Bring one knee up and pull it gently into your chest for 10-15 seconds, and then relax. Repeat five to ten times for each side. Lie on your back with both knees about 900. Then push your feet into the floor, squeeze or tighten your buttocks, and lift your hips off the floor until the shoulders, hips, and knees are all in a straight line. 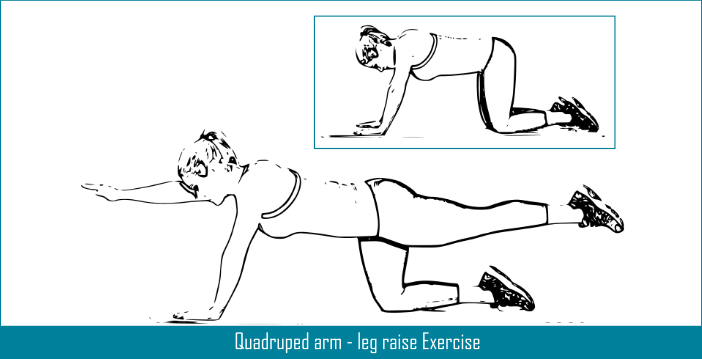 Hold for about 5 sec, and then slowly lower your hips back down to the floor and rest for up to TEN seconds. Repeat 10 times. Using backrest for your chair may help to minimize the risks involved due to poor posture, for those who have to spend more time sitting. Lie on your back, hands above your head. Bend your knees and roll them slowly to one side, keeping your feet on the floor. Hold for 10 sec. Repeat 3 times on each side. Kneel on your knee, the other foot in front. Facing forwards, lift the back knee up. Hold for 5 seconds. Repeat 3 times on each side. Lie on your back with your knees bent and feet flat on the floor. Don’t press your neck or lower back to the floor. 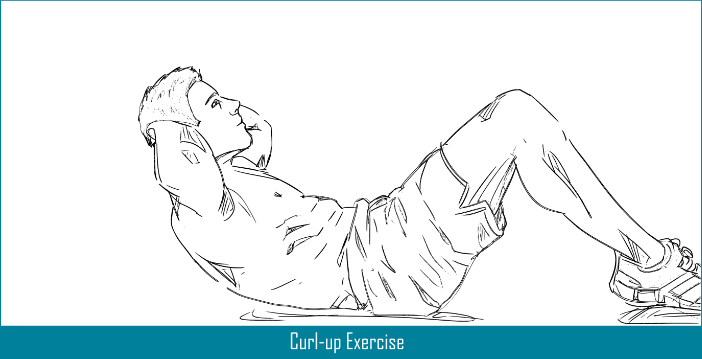 Then tighten your abdomen and curl halfway up, keeping your head in line with your shoulders. Hold this for 5 sec. Uncurl to lie down. Repeat 3 sets of 10. Lie down facing up bring both knees toward your chest then pull your knees as much as you can. Hold for 10-20 sec return your legs to the floor. Do the exercise about 10 times. 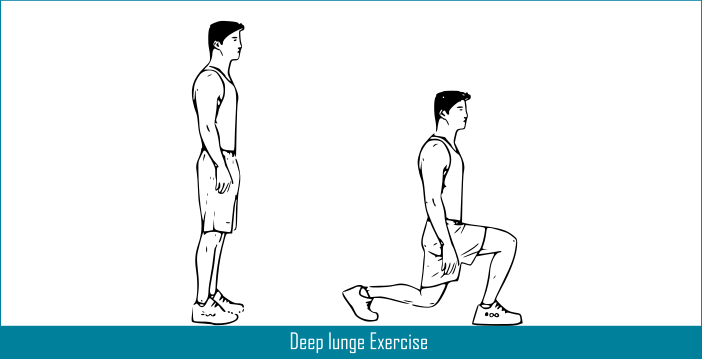 You can do this exercise with single or both legs once. Lie on your right/left side with your legs straight. Prop yourself up with your right forearm so your body forms a diagonal line. Rest your left hand on your hip. Brace your abs and hold for 1 min or 30 seconds. Be sure your hips and knees stay off the floor. Get down on your hands and knees. Tighten your abdominals to stiffen your spine. 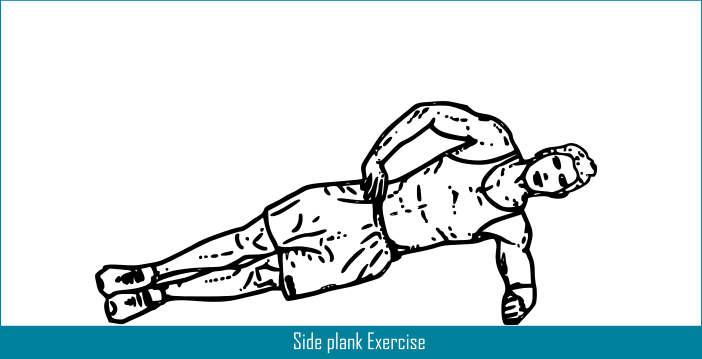 By keeping your abdominal muscles tight, raise one arm and opposite leg away from you. Hold this position for 5 seconds. Lower your arm and leg slowly and alternate sides. Do this 10 times on each side. Lie on your back. Tighten abdominal muscles and raise your legs off the floor at a 900 angle so your legs are parallel to the floor. Raise your arms and push your hands into your thighs. Simultaneously lower your left leg and right arm until they are just off the floor and pause for a second before returning to start position. Repeat for the leg and arm on the other side. Perform 10 repetitions. Back Pain, Spine Surgery back pain, back pain exercises, low back pain exercises, spine strengthening exercises, Spondylolisthesis, Spondylolisthesis Exercises, Top 10 Exercises for Spondylolisthesis. permalink.